in the mountains is run by Nigel Edwards to provide professional instruction and guiding in all aspects of outdoor activities in both the summer and winter months anywhere in the UK. He will endeavour to offer you the best possible professional guiding and instruction in your chosen activity, tailored to suit your abilities and aspirations. 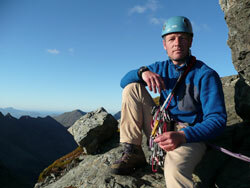 Nigel started his career in North Devon in the late 1980’s as a climbing, surfing and kayaking instructor. He was soon tempted by the Himalayas (Nepal) where he was head raft guide and a trekking guide for Himalayan Encounters for two seasons. Since the early 1990’s Nigel has been based in the Lake District and has worked as an outdoor specialist for a variety of the local companies, outdoor centres and private clients. Nigel has also worked extensively in the Arctic for Tangent Expeditions since 1997. This has taken him to many regions of Greenland and Baffin Island. His biggest achievement was getting Ian Wright (the x England and Arsenal footballer) to the top of Gunnbjorns Fjeld, the highest peak in the arctic.